Once you’ve decided to create a website, it can be tempting to jump right into the “fun” stuff—picking your colors, dreaming of photos, comparing different fonts. But before you dive in, I’m going to try to convince you to hold off for just a little bit. Some posts online will recommend that you answer anywhere from 50 to 100 questions before you should even start building your website. This is not one of those posts. 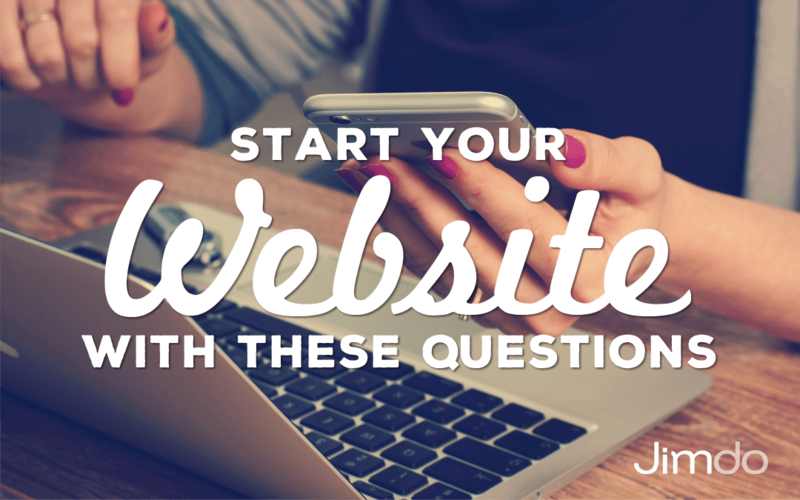 But if you can take the time to answer—and I mean really answer—three basic questions about your future website, you’ll have much more fun in the later steps, and build a better website to boot. What if you already have a website? No problem—you can still develop answers to these questions, and use those answers to adjust your site and keep improving it over time. How much do they already know about your business/product? What kind of image do you want to convey to them? New visitors: If you’re a freelancer or providing a professional service, many of your visitors will likely be new, and you’ll need to introduce who you are and what services you provide. Once you have the new client, they already know you and might not come to your website much anymore; they’ll just contact you directly. Returning visitors: If you run a website for an organization, with an event calendar, blog, etc., you may find that most of your visitors already know who you are and are checking your site for news and recent updates. So while it’s always good practice to explain what your organization does, many of your visitors won’t need that information. A mix of both: If you run an online store or a blog, you’ll likely have a mix of new and (hopefully) returning visitors, meaning that you’ll have to develop a structure that works for both of them. If you already have a website, you can find out exactly what your mix of new and returning visitors is using Google Analytics. One example of balancing different audiences comes from the blog Dinner, A Love Story. On the homepage of this popular cooking website, you’re immersed in the latest blog post and news. Most visitors probably go straight to that central content, because they know the site already and they don’t need to read the “About” story before getting to the latest posts. For new users, the website also has a page in the top navigation called “First Time Here?” Click that link, and you’re taken to a welcoming page with the blogger’s background story, frequently-asked questions, recommended reading, and signup links to the newsletter. So the website prioritizes the needs of regular visitors on the homepage, but also provides an easy way for new visitors to get oriented and involved. Note that your audience—and your understanding of them—might change over time. It’s a good idea to check back every once in a while to make sure your site still matches your visitors and their interests. 2. What are the top three things visitors should be able to do when they come to my website? Once you’ve answered the first question about your audience, you’ll be able to move on to what this audience is actually going to do on your website. Some web developers start by asking what the “goal” of a website is. To me, that question can be too broad. A goal can be to get customers, spread information, make money, take over the world, etc. But it’s not always helpful when planning a website. Other developers rephrase the question in more basic terms—what are visitors supposed to do on your site? It’s a deceptively simple question that helps bring the conversation about “goals” back down to earth. And the idea of the exercise is to prioritize three action items. Not one. Not 10. Three. Anything that doesn’t make it into the top three can still be included on your site, but it shouldn’t be your focus. If you can only narrow your list down to 10 action items, then you’re probably expecting people to accomplish far too much on your website—meaning you’ll present too many options, visitors won’t be able to find what they need, and they may quickly leave your site for somewhere else. What else can you gain from answering this question? It helps you streamline your site and focus only on what visitors are looking for. Of course, this doesn’t mean that you can only offer three things on your website. It just means that you choose three things to emphasize and make readily available. This can also keep you from making one of the more common website mistakes we see—shoving too many items into your top navigation. It helps you put yourself in your visitors’ shoes (also known as “user-centered design”). In short, user-centered design means designing something based on the users’ own expectations and needs, rather than forcing them to learn and adapt to your way of doing something. Thinking about what visitors will want to accomplish can help you design a site that’s easy for them to use, rather than one that’s focused on you and your interests. It helps you figure out your “minimum viable product”—what are those essentials you need to get your site off the ground? This approach will keep you from getting bogged down in lots of details or page after page of content before actually getting your site going. For an example of this practice in action, check out the Kickstarter website. I haven’t talked to Kickstarter, but I would guess from their site that the three things they want people to do are 1) browse projects, 2) start their own project, and 3) search for a specific project. Notice that their design isn’t based on everything people could possibly do on their website—learning about the company, watching videos, reading the latest blog posts, following on social media, etc. Those options are all de-emphasized further down on the page. But above the fold, the focus is on three main actions. Another good example comes from Jimdo website Artistic Dry Cleaners in Portland, OR. What’s the number one thing visitors want to do when they visit a dry cleaner’s website? How about finding out where it is? Here, they’ve helped their users by putting their address and phone number front and center in their Header Text. Second, to find out where the place is, people probably want to know what services they provide. Bam!! That information is right under the header. And, right below that, they provide a map and their operating hours. (P.S. This website uses Jimdo’s Zurich template). 3. What material do I have to work with? If you can outline the pieces you have to work with, it will be easier to see what’s missing and what you need to gather to create that minimum viable product. It will also show you which pieces are perhaps unnecessary because they don’t fit with your answers to question 1 or question 2. More and more, images really make a website. They help establish a style and mood on your site, break up text, keep readers engaged, and they often help make templates look amazing. It can also be nice to include some behind-the-scenes photos of your office or workspace on your About Page so that people can get to know you. You don’t need to take all of these photos yourself—there’s a growing list of websites that provide high-quality stock photos free of charge. It’s also easier than ever to take high-quality photos with a smartphone. Just make sure that your images are large enough to show up well for all screen sizes. There’s a growing list of websites where you can find high quality, royalty-free stock images for your website. Tip: Use images that are the same style and size for a cohesive look. Remember that what you write isn’t carved in stone. Part of the beauty of having your own website is that you can tweak the text whenever you want. You also may not need as much text as you think you do, since visitors likely won’t spend too much time reading it. Reading on-screen tends to be much more mentally and physically taxing than reading on paper, and people tend to remember less of what they read when it’s on-screen, too. So don’t try writing too much before you actually start creating your website. Text that looks normal in a Word document or on a printed brochure can seem way too long once it’s on a screen. One place I would say not to skimp on text is on your About Page. This is where you can tell the story of what makes you unique. But remember that unless these add-ons relate directly to your audience and the top three actions you want them to take, they most likely aren’t necessary for you to get your site off the ground. Check out this infographic on the Anatomy of a Business Website for more information on the different parts of a website. It’s an old expression among writers, meaning that you sometimes need to get rid of your favorite passages for the greater good of the entire piece. The same goes for websites too. You may have material that you would absolutely love to have on your website—photo galleries of every event you’ve ever hosted, widgets and pop-ups that promise to do all sorts of cool things, hundreds of work samples for people to scroll through…but if you can turn a critical eye to this content and remember who your audience is and what you want them to achieve, you may find that much of this content isn’t really necessary. Getting rid of it will, I promise, create a better, clearer, and more successful website. What are the top three things visitors should be able to do when they come to my website? What material do I have to work with? Websites can and should evolve over time—there’s no need to have everything set and decided before you start. But once you know who is likely coming to your site and what you want them to do once they get there, the content, structure, and other pieces will start to fall into place. And that’s where the fun really begins!